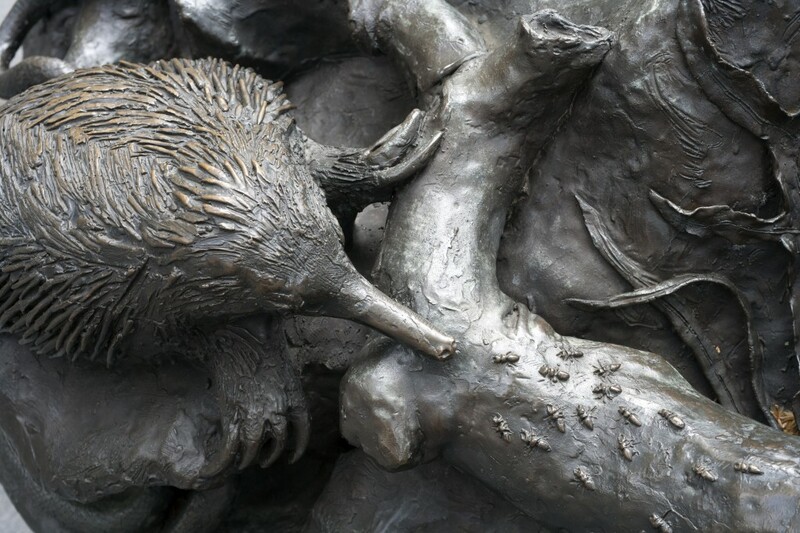 This fountain features a series of figurative and non-figurative forms made in bronze and connected by separate, linked pools. 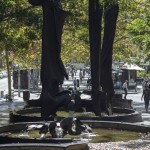 From the central cascading fountain, four columns in bronze rise out of the pool. An array of Australian flora and fauna, including frogs, snakes, goannas, echidnas, crabs, birds and tortoises appear to be playing in the pools. 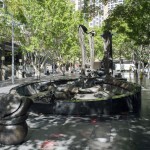 Located in the pedestrianised plaza on the corner of George and Alfred Streets near Circular Quay, the artwork is an integral part of Herald Square. 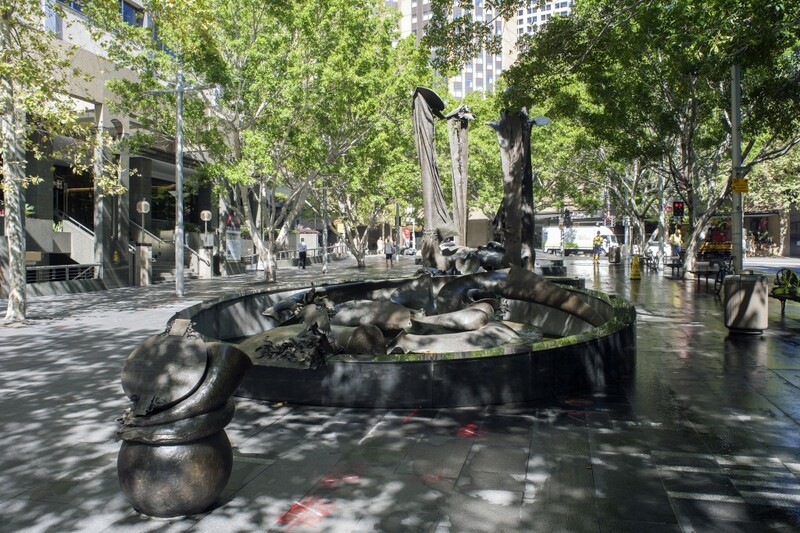 The Tank Stream Fountain was presented to the City by John Fairfax & Sons Limited in 1981 to commemorate the 150th anniversary of the founding of the Herald in 1831. 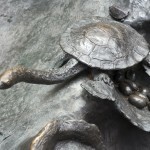 The sculptor’s brief ‘was to create an association of water and bronze’. In doing so, Stephen Walker connected the fountain to the Tank Stream, the European settlement’s first water supply. An inscription on a plaque on the western front of the fountain describes the inspiration Walker drew from the fountain’s historic location. 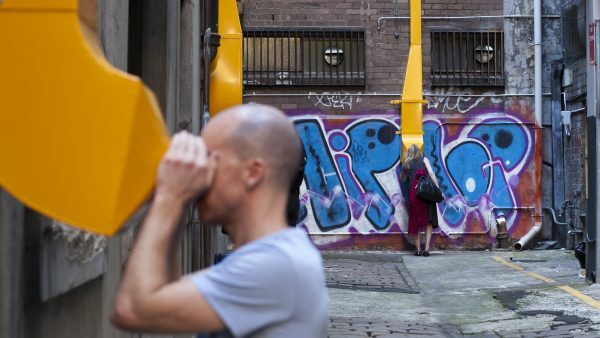 By connecting the fountain to an original outlet of the Tank Stream, the artist sought to highlight a union between the Sydney Morning Herald and Sydney’s European history. 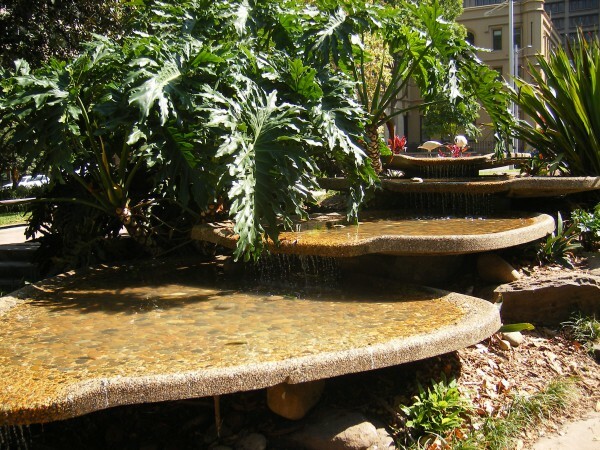 The fountain, which is also known as the ‘Children’s Fountain’, is said to be dedicated to ‘all the children who have played around the Tank Stream’. Stephen Walker was born in Melbourne in 1927 and studied painting at Melbourne Technical College and Hobart Technical College. It was not until around 1952 that he began to produce sculptural work, predominantly in wood. During the 1950s and 1960s, Walker spent some years studying in England, Rome, Florence and Prague before returning to Australia in 1964. 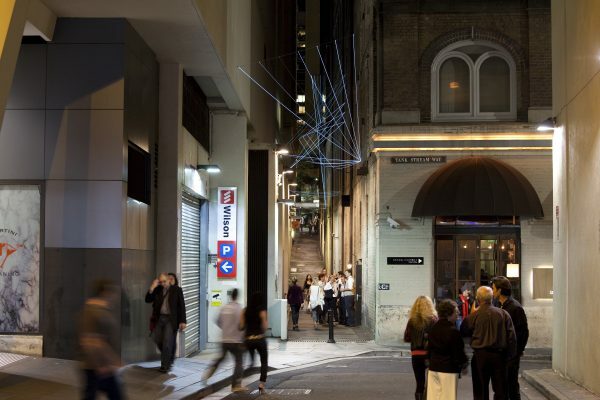 On 25 June 1979 the Sydney City Council accepted an offer by John Fairfax & Sons Limited to enhance the streetscape between George and Pitt Streets in Alfred Street, to commemorate the 150th anniversary of the founding of the Herald. 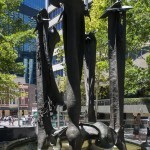 The sculpture represents the largest private gift to the City Council at that time. 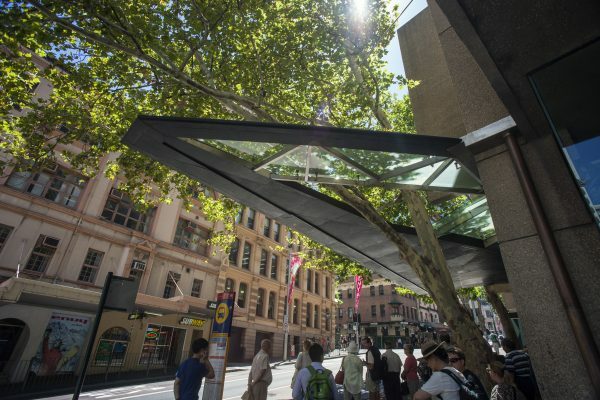 As Council had already planned to improve the area’s streetscaping, the additional work was treated as an ‘extra’ on the Council’s existing contract with Melocco Bros. Pty. Ltd. 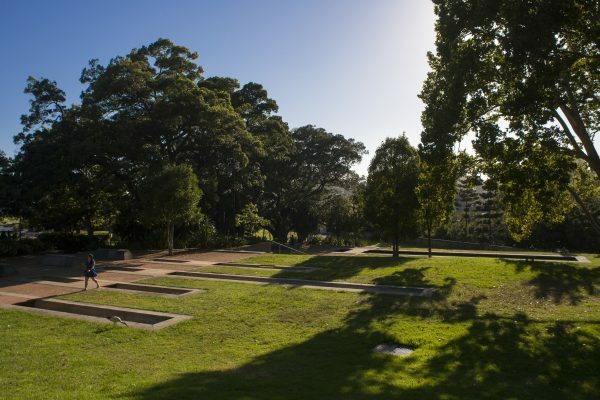 The additional landscaping work, costing $356,154.50, was subsidised at a cost of $183,495.50. 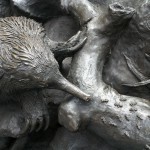 The Herald matched this amount in addition to meeting the costs involved with the sculpture itself. 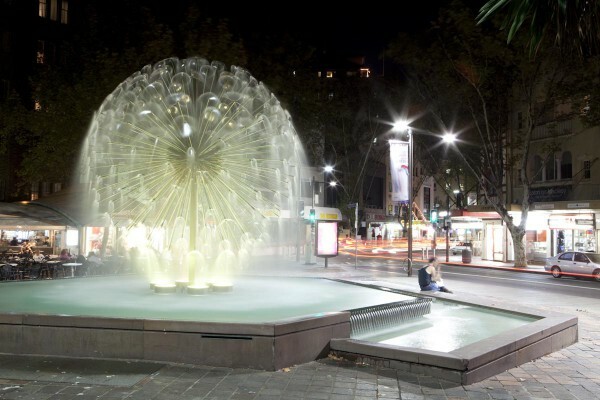 Work proceeded to schedule and the Tank Stream Fountain was dedicated by the Lord Mayor on 16 April 1981. 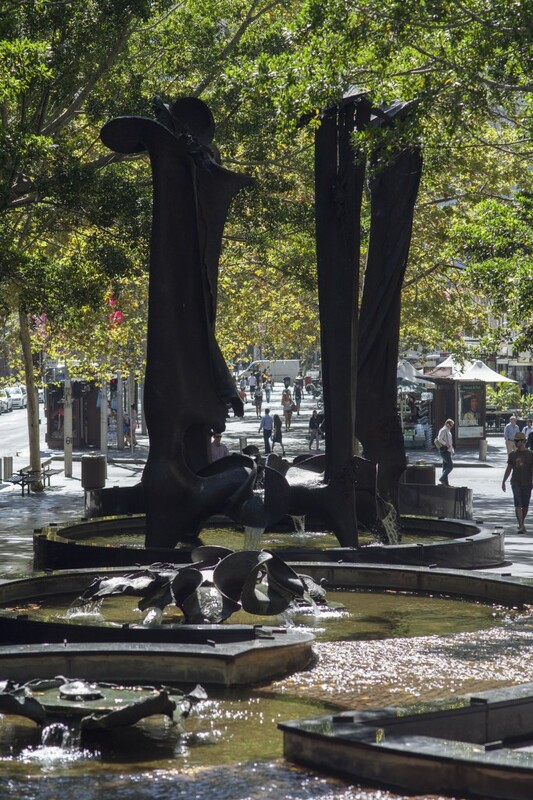 A plaque reads: “The Sydney coat of arms / the tank stream fountain / and the landscaping of / the square were donated to the / City of Sydney for the pleasure and / enjoyment of citizens and visitors by / John Fairfax & Sons limited, proprietors of / the Sydney Morning Herald on April 18, 1831. / The right Hon. the Lord Mayor of Sydney, Alderman Douglas W. Sutherland, A.M., / accepted the gift on behalf of citizens / on April 16, 1981 / J.O. Fairfax L.P. Carter, O.B.E. Chairman, Town Clerk / John Fairfax Limited / (The Fairfax crest.)”. On the western side, a plaque reads: “1788 / A stream flows into Sydney / Cove. The European settlement / of Australia begins along its / sandstone banks. 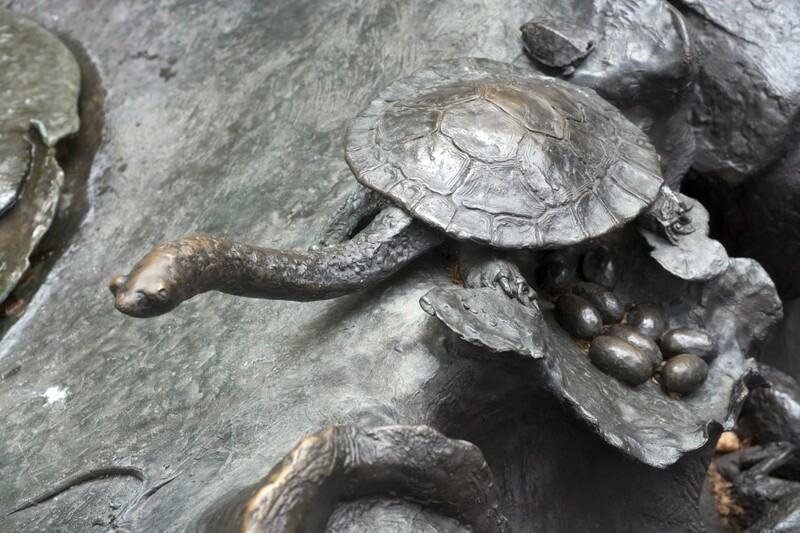 Soon drought / strikes and storage tanks are carved / from the stone, Hence the name Tank / Stream / The seasons pass / 1981 / The tank stream fountain recalls / mankind’s past dependence on this / flowing stream and our links / with life around this region / Sculptor: Stephen Walker”. 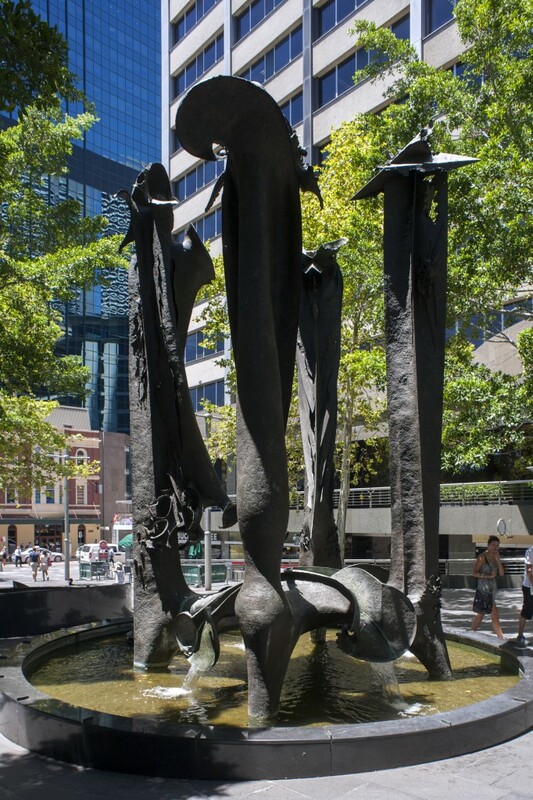 A plaque set into the eastern wall facing west reads: “The Children’s Fountain / Dedicated to all the children who / have played around the tank stream / Presented by John Fairfax & Sons Limited, 1981”. 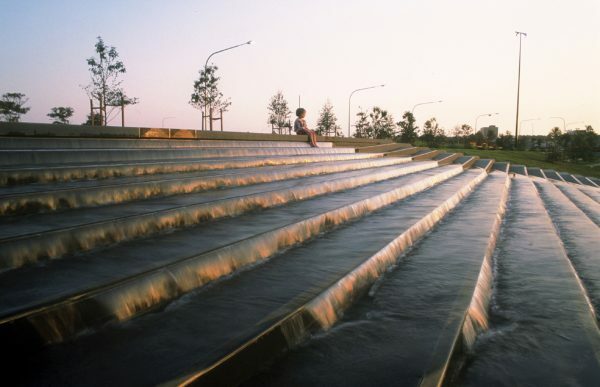 A stream flows into Sydney Cove. Presented by John Fairfax & Sons Limited, 1981.